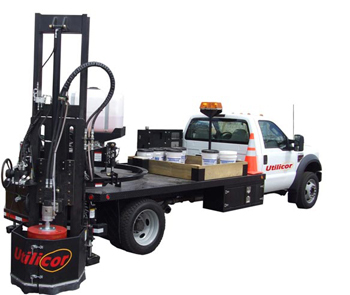 The Series 500 coring truck from Utilicor™ Technologies is the most robust coring truck available on the market today. Used by dozens of gas utilities and their contractors for over a decade, the Series 500 allows its users to quickly cut keyholes through roadways and sidewalks at a rate of 1″ per minute due to its 5000 P.S.I. of isolated down force focused on the coring drum and center pilot bit assembly. Two, truck mounted, independently operated hydraulic stabilizers allow for the entire suspension of the truck to be isolated from the coring process, allowing for quick and accurate core cuts. This is the only heavy duty keyhole specific coring truck produced in the industry, and it will perform year after year beyond all expectations. Plug-in remote pendant control provides mobility for ease of operation for all coring functions. Large 100 gallon water tank for extended coring work, and available glycol winterizing system for colder conditions. Utilicor exclusive central pilot coring process simultaneously cuts central pilot hole, which facilitates safe and easy removal of core, and eases reinstatement process. 6” @ 10.5lb/ft structural channel sills, running the full deck length with six bolt on hold down assemblies. 25” diameter rotating turret assembly with worm gear rotation and guard fastened to understructure and decking. 270 degree rotation, hydraulically operated vertical arm assembly, with horizontal storage positioning and hydraulic auto control ring hold down system. 12” to 24” diameter wet drilling core bit with 48” travel stroke using fine proportional control. 100 USG plastic water tank assembly located on the horizontal boom. Hydraulically driven high-pressure water pump, 5.5 G.P.M. @ 1500 P.S.I. with 25 ft of 3/8” hose and high-pressure handgun. Electric water pump, 1.3 G.P.M. @ 30 P.S.I. and includes 1/2” diameter water hose running to gland assembly on cutter drive shaft for cooling of cutter head and additional hose for cleaning and cooling outside of cutter. Two rear stabilizer legs, hydraulically operated. Power-take off installed on truch transmission. Includes suction and return lines, sight glass, temperature gauge, fill port, drain port and oil filter. Plug in remote pendant control with 25ft cable extension for operation of manipulator/cutter assembly and stabilizers, with boom mounted control panel and emergency shutdown switch. 2 Under-deck mounted Toolboxes (48” L x 18” H x 18” D) 1 Pendant control box, under-deck mounted on driver’s side. Traffic Cone Carrier installed on the deck Deck mounted Utility Storage Area 28 or 22 square foot (see Deck Length) Spare Drum Carrier installed on the deck Dual LED flashing amber strobe lights. One 18" diameter Pro II diamond segment coring drum with "A" flange drive adapter, one steel pilot shaft, one 2 3/8" bi-cone pilot bit, or a 2 3/8 tri-tooth carbide bit,16” diameter pavement protecting impact plate and one standard core-puller. Powerful 500+ lb capacity boom-mounted core hoist (12V) that safely and easily handles the heaviest 18-inch or 24-inch diameter cores. We offer a choice of deck length depending on whether or not you want a larger on deck storage area or a shorter overall length. The longer unit with a 14.7-foot deck and 28-square foot on-deck storage area mounts on a cab & chassis with a 201" wheelbase and a Cab to Axel length of 120". The shorter unit with a 13.3-foot deck and 22-square foot on-deck storage area mounts on a cab& chassis with a 189" wheelbase and a Cab to Axel length of 108". Both units are priced the same. The longer model is shown in the illustration.